Real Bean Records is an EMPLOYEE-OWNED, independent record label dedicated to the preservation of the music popularly known as Jazz, in all its wonderful forms, and to the musicians who create it. Jesse Collins Quartet "New York By Night" (Real Bean 1112) is a compilation of live material of the Jesse Collins Quartet, recorded in NYC clubs, including Smalls and Fat Cat, from 1995 to 2002. It is a re-release of the live tracks from" Introducing Jesse Collins"(Lat Cat Records), which was voted a 2003 Jazz Times magazine "Critics Pick Top 10." These recordings are of Jesse Collins' working band during the period he lived in NYC as a young musician. These warm, scratchy, "bootleg" recordings reflect the art of musical interplay and musical conversation that remain the essential elements of Collins' creative music-making process. 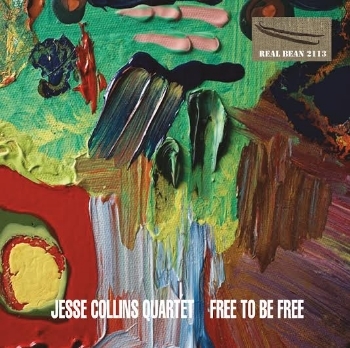 "Free To Be Free" (Real Bean 2113) is the first studio recording by the Jesse Collins Quartet for Real Bean Records and was the 2014 Syracuse Area music award(SAMMY) "2014 Jazz recording of the year". Incorporating traditional jazz harmony concepts of Bebop, Modal Jazz, and Harmolodic Jazz, with the modern rhythms of Gospel, Funk, R&B, and Rock, "Free To Be Free" is both a visceral and cerebral experience in Music. Comprised of five Collins originals and a Collins arrangement of the Led Zeppelin classic No Quarter, JCQ's "Free To be Free" is for all people and occasions.